I wanted to do something a little different with the dash. 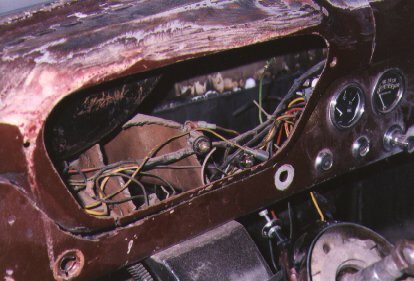 For some reason I just didn't like the Instrument cluster hump on the '53-'55 F-100's...OK, it bugged me. I didn't mind the '56's...but mine was due for a change. Out came the trusty grinder and 1/32" cut-off discs and away I went. 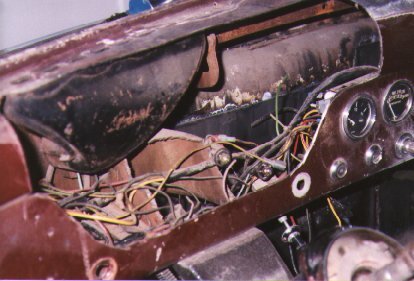 With the hump removed you can see I "might" have a bit of a problem with the wiring harness. 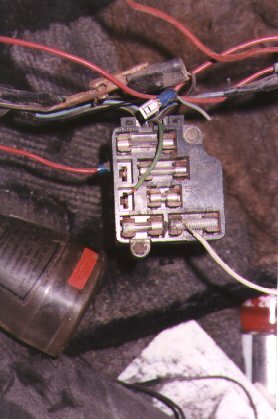 Upon further inspection, I noticed and intresting fuse that I'm pretty sure an IDIOT installed prior to my buying the truck. Tack...tack...tack...with a little gentle persuasion from a bodyhammer and dolly the dash is starting to take shape. This is where I'll leave this mod for now. 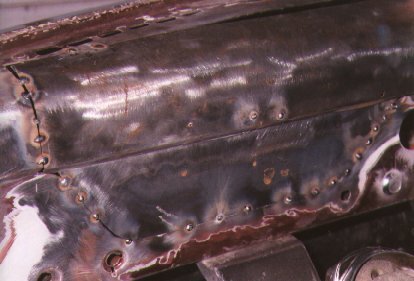 Finish welding after a little hammer and dolly work to get the curves just right. Perhaps a small filler piece or two up top to take care of that gap and it should be ready for the finish bodywork.